News released earlier this month suggests that fishkeeping has experienced a substantial decline in the last five years. But is everything as it seems? Nathan Hill has a look at the numbers. “88% of all statistics are made up on the spot,” comedian Vic Reeves once observed. But as humans, we seem powerless to resist the draw of numbers. Like nocturnal bugs to a candle, we throw ourselves at the mercy of sensational looking double-digit declines. This month, a newspaper made substantial claims about the fall of UK fishkeeping. “The number of households with a pet fish,” it proclaimed with near reverential authority, “is down from 17 per cent in 2012, to just 10 per cent in 2017.” By way of reference, the text cites a survey by data analysts Mintel. Or rather, it hauls out a couple of charts, and fails to quote any of Mintel’s text directly. Given that Mintel are asking almost £2000 for a one-off copy of the report, you’ll be unsurprised, dear reader, to know that I haven’t been able to quote figures either. I know nothing of the study sample size, the demographic — I lack all context. The text carries on, in places, as almost gleefully pejorative. In a piece laced with spurious assertions and galloping non-sequiturs, various hypotheses are put forward for this loss. Fish aren’t photogenic enough for selfies, comes the claim. Cats, dogs and rabbits are the new ‘go to’ pet, seems to be the unstated premise here, while the author wilfully overlooks that the sole chart on which this case is made shows a marked decline in those pets too. But why let good old-fashioned reasoning inhibit a story? Of course, the author of this piece seems to have overlooked something salient. In 2012 the very same paper reported that the data showed that around 10% of the UK — one in ten households — owned pet fish. At that time, pet fish were said to be growing in market share, increasing to the tune of several millions of extra individual fish bought by a benignly piscivorous audience. Back then, the journalists were plucking out their own reasons for this explosive growth. ‘Pet fish are easier to keep than cats or dogs,’ was the suggestion, with the writer clearly oblivious to the vagaries and intellectual exhaustion associated with keeping a magnificent reef tank in bloom. The Pet Food Manufacturing Association (PFMA) has been tracking pet populations in the UK for the last decade. I’ve no idea how many people Mintel polled in their survey — the journalists trampolining on the all-important ‘17%-down-to-10%’ number seem to have elided here. The PFMA has an effective study sample of 8,000 respondents. How representative that is of the wider UK when extrapolated upwards, I do not know. Not all things expand evenly, as my waistline would testify. In 2012, on PFMA polling, they estimate that 20 to 25 million individual fish were kept in aquaria — around 9% of UK households, if the trend of later years is to be trusted. To confuse things, there are also a similar number of pond fish kept, equating 6% of households. As fishkeepers we are aware that the two camps are usually mutually inclusive rather than exclusive. Assuming the most absurd case scenario that everyone in the survey who owned an aquarium refused to own a pond, and vice versa, then we get a combined effort of 15% of UK households with a pet fish. Racing through the years, only stopping to grab some souvenir numbers (9% aquarium, 6% pond for 2014; 9% aquarium, 5% pond for 2016 — PMFA figures) we hit the apocalyptic scene of current fishkeeping: 8% aquarium ownership, 5% pond ownership for 2017. Maths wasn’t my most powerful subject in school, but I was smart enough to calculate the hypotenuse length on a right-angled triangle. Subtracting 8% and 5% respectively from 9% and 6% seems well within my remit, so unless I have missed out on some major mathematic reformation movement, I can only see a 1% decline in fish ownership in each of the two camps. As a retailer, and faced with figures like that, I’d probably not consider selling up and fleeing to join the ex-pat crowd of Spain any time soon. All in, we seem to have a market that has somehow managed to grow, while simultaneously peaking and declining at the same time. Apologies, but I’m not buying in to it. I’m not going to pretend there hasn’t been a decline in fishkeepers in the last five years — what little data there are support it. But I am going to contest the numbers. Never one to miss the opportunity to rant, I’m also happy — as someone who has followed the industry for my entire life — to put forward my own unsubstantiated suggestions about why any decline is happening. The difference in my own case is that I’ll carry the placard with shining letters above me: specious claims right here, approach with caution. Let’s start with the nano tank. Those little bundles of affordable, high maintenance, beginner traps have been a target of derision from me for years. I would question the role they’ve played in any decline. I think I’d argue that what we’re seeing now is a reversion to the normal, if there’s any localised ‘decline’ in fishkeeping at all. Nanos were peaking in sales around the 2012 period. The industry was generating a higher number of new aquarists, with the pathetically optimistic argument that all of these keepers would somehow master their nightmarishly hard, 25 litre goldfish set-ups and progress to something bigger and better. Don’t kid yourselves, stores. We all knew that many of those tanks, once they left our shops, would promptly be furnished with ill-fated goldies sourced from our nearest competitors. The nano market is a bit like a drunken pilot — it was inevitably going to get grounded. I wrote recently about the conspicuous absence of nanos at the AQUA trade show I attended. The air carried the collective hum of manufacturers and retailers pretending that the nano phase never really happened. I was there, I kept asking folks where the tiny tanks had gone. While I haven’t any data to support me, my gut feeling is that the number of keepers in the 2012 polls was in part tainted by the short-term, new-wave glut of consumption that was the nano buyer. Five years on, with nano sales evaporating away, the figures reflect the truer number of devotional, not ‘faddy’ hobbyists. Here’s another thought. The working man is up against tough finances. Not every fishkeeper is a CEO on £250K a year. While livestock hasn’t really increased in cost in any considerable terms — based against old figures from the 1960s and 1970s, I noted that the price of fish has actually dropped in real terms — hardware is pricey. Low-iron glass, artisanal acrylic hardware, supplements that cost as much as a person’s monthly food bill: all these things have conspired to move fishkeeping slightly further from working-class reach. And let’s cut to brass tacks. People are spending their money on some considerable ‘must have’ luxuries. Recently, while picking up a disposable phone for a one-off job (eventual cost 79p for my new handset) the couple alongside me at the counter were negotiating their new phone tariff. At £92 a month for the next 24 months, a mobile phone provider had just gobbled up £2,200 of potential reef tank money, right there. ‘Busy fools,’ a former boss once told me. He warned that I would be busy and poor if I always chased the low-end sales. The money — the mark-up — was in the high-tier gear. And many retailers have lived to this rule. 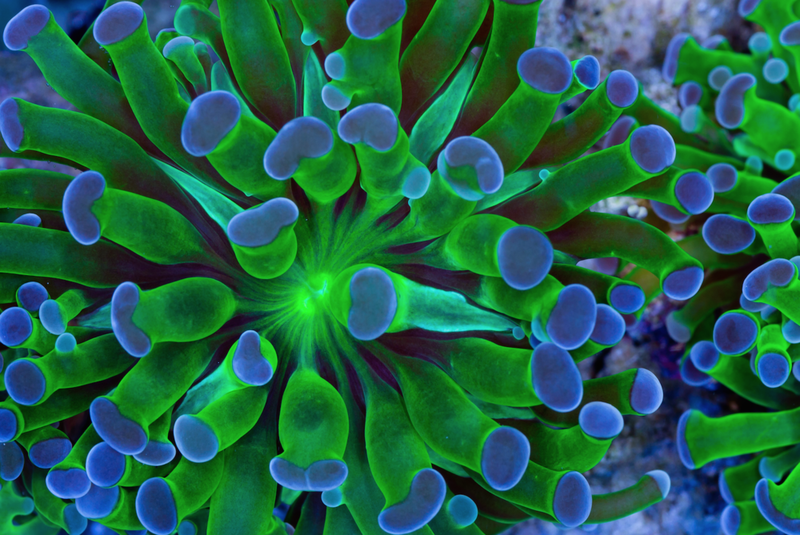 The sale of a single £1500 marine set up might bring in as much profit as 15 x £100 nano tanks. Many stores are eager to promote their high expense range. That means less interest in stocking the accessible gear. And that means prices pushed slightly further from the cash-strapped newcomer. Then there’s the shift in social conscience, especially among the younger generations now coming of age, where they have disposable incomes and a choice of how to spend them. The shift in perception has been gradual, but is now too great a malignancy for aquatics to overlook. A lot of people take a stern position, that no animal should be kept in tanks. As representatives of a trade that revolves around the captivity of animals, we can open our arsenal — we assist conservation (sometimes), we maintain species that are now extinct outside of aquaria, we provide our fish a better life than anything they’d have in the wild, we are stewards who protect our stock — but these will fall on deaf ears, or worse. For a certain demographic, what we do is indefensible. And, as a final thought, many of our advances have become our hindrances. The development of the hobby — in all the right ways — has made it terrifying. Circa. 1980 you had to buy a tank, add some fish, see if they survived, add some more, and keep some medicine on hand for the occasional outbreak of whitespot, and that was about it. Add some ant eggs, and when Finny the household goldfish carped it after six months, it’d be flushed and a replacement brought in. It was diabolical, but it was unthreatening. Those of us who worked through the 90s will remember the efforts put in to heightening awareness of things taken for granted now — the need to mature a tank, the need to test ammonia. In 2017, trying to buy a fish is like subjecting oneself to Monty Python’s Spanish Inquisition. How long has the tank been running, with how many fish, how often are they fed, when did you test, what did you test for, no exactly what did you test for? If I was joining the hobby for the first time, I think I’d be overwhelmed. I’m relying not just on my own research abilities, nor on the knowledge of my retailer, but also on the retailer’s ability to convey information in a way I can understand. I’m up against heaps upon heaps of conflicting, confusing and often outright contradictory information found online. At a guess, I’d say I would be at least 17% more overwhelmed by it all than I was when I started in the late ‘80s. Maybe once I sized it all up, I might feel 88% better off splashing out £92 a month on a new phone too. Let's take the time to listen a bit more to those with new ideas, rather than swatting them down like flies, says Nathan Hill. We love a rebel, don’t we? I think we like underdogs in general. Very few people want to see David squished underfoot by Goliath, but love it when the little guy takes out the big guy with some kind of unexpected roundhouse kick. Upstarts who stick it to the man are all the rage. Establishment figures are predictable, authoritarian — boring. Then comes along the wayward rapscallion who breaks all the rules, defies all the conventions and wins, and we can’t get enough of it. Except in fishkeeping, it seems. If the hobby was a school, I wonder how many of us would be sat at our desk, arms crossed and shaking our heads in uniform complicity, ashamed by the loud kid at the back of the class who dares to question the teacher. Take aquarium cycling, because it’s a nice and obvious topic. I probe a lot of people on this, and love to watch how discussions (predictably) pan out during spats. Sometimes I even provoke them using one of my many online aliases, just to see how quickly the firewalls come up. Rock up to any forum or social media discussion and ask about maturing a tank, and you’ll be met with a resounding, dour faced ‘must use ammonia’ approach, as though anything else is tantamount to drop-kicking your livestock into a bucket of broken glass. Filled with cyanide. I can see why defenders of the fishless cycle are so resolute in their stance. After all, even the official PFK stance is still that all tanks should be fishlessly cycled. But me, personally? I’m not going to lie, I’ve been quietly playing with a lot of bacterial products in the background, out of sight in my (not) lab and using highly (un)scientific methods, and you know what? Some of them work. As in consistently, repeatedly, and in a range of different circumstances. Real world conditions. Have I been endangering things? Not really, no. I live in the charmed position of having a handful of instant Plan Bs to fall on at the first whiff of trouble. But I haven’t needed them. Skeptical? Of course you are. Nobody is allowed to question the mighty fishless cycling republic these days. Damn my heresy, you’re thinking. Civil disobedience is STILL disobedience, right? To be honest, good on you for that scepticism. Too many companies have cried wolf over the bacterial thing for years. Promises in a bottle. And let’s be honest here — some of those early potions claiming instant maturation were, well, crap. They’ve a lot to answer for, because in not doing what they said they would, they created the culture of suspicion we now have whenever anyone tries to tout a new wonder chemical. Plenty of us got our fingers burnt in those days, and so badly burnt that we have the bitterest memories of products that didn’t live up to their expectations. It was all the worse because we’re not talking about something disposable, like a radio or teapot. What was happening as a result of spurious claims was death and suffering to animals in our care. We were doing everything right, we thought, but it turned out that death was still with us. Then it turned out it wasn’t always our own fault after all. Damn. but what I’m not for (and I have done this myself so many times) is a dogmatic rejection of it, on no grounds other than ‘because’. Thing is, technology, and that includes biotechnology, is advancing. The fishless cycle works, it’s tried and tested. But it is longwinded, and most people getting into their first ever aquarium are impatient. Fishkeeping is a culture shock in a world of instant gratification. Of course the holy grail of aquatics is the instant maturation liquid (or pill) that lets you go to full capacity in an instant. That’s why so many companies word their packaging in such a way as to allude to that. Some can’t deliver. Some I’m finding are pretty close. It’s worth remembering that sometimes the upstart really does bring something new to the table. But then there’s safety in the tried and tested methods of conformists. Perhaps, if we occasionally took the time to listen to each other, rather than drowning each other out in a frenzy of our own dogma, we’d make even more progress. After all, I’d hate to see the hobby stifled and regressive, all because it was so busy swatting away the very revolutionaries who could have eventually ironed out all of its kinks. Quick — there it is! Nope, sorry, you just missed it... Some of us live for that annual appearance by the resident catfish! Someone who lives from one fishy ‘hit’ to the next. I was speaking to some industry heads recently. They weren’t entirely fish people, if you get my drift. They asked me to stereotype the average fishkeeper, likely so that they could plan a way of making a targeted sales pitch. I pondered this for a bit, and had to reply that beyond a passion for fish, there was no core ‘identifier’ for a fishkeeper. You can’t draw any conclusion beyond ownership of some kind of aquatic lifeform. Actually, even that’s wrong. I still class myself as a fishkeeper, even during those times I don’t have any tanks running. It just seems to be that much a part of my identity. We are a diverse bunch. This last week, a week involving long shifts, food on the road (if at all), and little sleep, I visited a spread of northern and Scottish aquarists. Over that period, I met aquarists who were lavish or frugal, and everything inbetween. I met retailers who’d look as at home in a quaint village café, working as a husband and wife couple, as they do in a fish shop. I met keen-eyed go-getters, hungry for fishy wheeling and dealing. I met a man who just nodded approvingly — knowingly — when I set eyes upon a fish we had mutual love for, and I met a man with a headful of ethical concerns and a hipster approach to his store design, wardrobe and grooming. Put all of these people together in one room and they’ll get on better than a syndicate of lottery winners. See them individually in the street, and you’d never be able to make a connection between them. Yet every single one of them had fish in their veins. I’ve been a fishkeeper in one form or another for 37 years, from student, then public aquarist, through retail, to teaching, to writing. In all of that time, I’ve never had the ability to tell a fellow hobbyist at a glance. Hold up a bag of fish in front of me and within five seconds I’ll tell you the exact number of fish in it. Give me a net, and I can tease out one specific Glowlight tetra from a shoal of 500. I even have something of a sixth sense for feeling when a tank isn’t 100% on water quality. These are all acquired skills. But show me a human face and ask ‘fishkeeper or not?’ and I haven’t a clue. Some of us eat fish, some don’t. Some of us catch fish, others hate the idea. Some of us have one tank, some of us lose count at 50. Some of us breed our fish compulsively. Some of us danced with delight that one and only time our guppies produced offspring. Some of us keep underwater gardens, sculpted to perfection and Kings for a day before we move to the next project. Some of us like clinical, barren tanks and lab-grade fish. Some of us like leaves, mulch and mulm, and algae swinging from branches. Some of us want our fish out and about, all day, every day. Some of us want a catfish that flashes a single whisker once a year, and consider ourselves blessed to see it. For me, fishkeeping is a state of mind, not a measurable characteristic. We’re all in this game because at some point, somewhere down the line, that alien underwater world imprinted itself on our minds and gave us a big shot of dopamine in doing so. I think secretly we’re all addicts, on one level or another. To this day, looking in to aquaria, especially with the light shining, pumps humming and the bubbling sounds that accompany it, sends me into a hypnotic place that nothing else in this world does. So what is a fishkeeper, beyond a person? An unashamed fish junkie, I say. Someone who lives from one fishy ‘hit’ to the next. Someone prepared to get so engrossed in their tanks that they easily forget a mealtime. And even if you try to give up the hobby, I don’t reckon that buzz ever goes away. I doubt it will for me, and I’d be surprised if it ever does for you. Today’s prize is a 250g pack of Hikari Cichlid Staple food, worth £8.49. An excellent quality daily diet for all cichlids and larger tropical fish, Hikari Cichlid Staple has been specially formulated to ensure the pellets are readily accepted and quickly devoured. Offering complete and balanced nutrition, it promotes excellent growth rates through improved digestion. The highly digestible pellets ensure clean, clear water. The floating pellets, which allow easy monitoring of amount eaten, contain stabilised Vitamin C which supports immune system health and promotes a long and healthy life. Masstick, Easy Booster and DKI marine make up the Easy Reefs prize bundle that we're giving away in Day 16 of our Christmas countdown. Win an Easy Reefs food bundle worth £35.47. The prize consists of Masstick 42 (£12.99), Easy Booster 28 (£12.99) and DKI marine (70g). Once it is rehydrated, it can be stuck to any surface of the aquarium, depending on the animals’ needs. The rehydratable powder formula allows Masstick to be blended with any mollusc or crustacean pulp as well as eggs from fish, molluscs and crustaceans, Artemia, mysids, copepods, rotifers and medicines that are administered orally. Once prepared and introduced into the aquarium, Masstick does not disperse into the water for hours, so it can be completely taken advantage of by fish and crustaceans. This feature allows the product to be used as “ad libitum” or rationed feeding. Because Masstick is comprised mainly of freeze-dried crustaceans, it does not contain fish skeletons and is thus very low in phosphates compared to its protein content. Easybooster is a liquid phytoplankton in single-dose bags that is ready to use, easy and clean. Easybooster 28 contains 28 blister packs. DKI marine marine comes in the form of tender granules and neutral buoyancy. It is available in three grain sizes. The main ingredient is freeze-dried shrimp (Palaemonetes varians) coming from the Veta de la Palma fisheries located in the Doñana Natural Space. Check out today's great prize, worth £98.99! An Arcadia LED Blade light is up for grabs in our countdown to Christmas. Win a 26cm Marine white LED Blade light from Arcadia. The LED Blade has design and light output at its forefront, the ultra sleek anodised aluminum case with a profile of just 8mm it has been designed to provide as close to an invisible light source as possible, whilst doubling up its function as a heat sink for the high power LED’s. What's hiding behind today's door? Malawi cichlid foods from FishScience. Six bundles of FishScience Malawi foods to be won, worth £14.80 each. We have six packs of FishScience foods to be won, each comprising a pot of Malawi Pellet and Malawi Flake. FishScience Malawi foods offer a unique formula containing algae and vegetables to recreate the natural plant and algae based diet that mbuna would eat in the wild.